Steam Music, a new addition to the platform that will allow users to listen to their music while they play games, will soon enter closed beta. The concept of Steam Music sounds pretty simple. Point Steam at your local music library, let it scan your collection and then play whatever music you want whenever you want, even if you're playing games, via the Steam overlay. The details are a bit thin but the system will soon enter closed beta for SteamOS and Big Picture mode, with a beta for the standard desktop mode to follow at some point in the future. 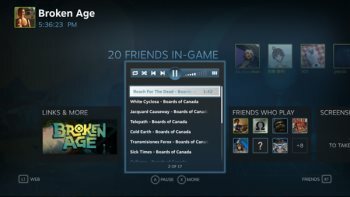 "With this beta, we're getting started with what we believe to be the most fundamental set of features to offer a great music listening experience within Steam," Valve's Christen Coomer wrote in the announcement. "As always, our next steps for the feature will be influenced by your beta feedback, so please share your feature requests, thoughts, and experiences in the music discussions." Restricting the initial beta period to SteamOS and Big Picture users makes sense because, unless I'm missing some aspect of it, the system would appear to be aimed primarily at them; conventional desktop users have the option of firing up their music player of choice, launching their game and then alt-tabbing back and forth as necessary - perhaps not as elegant a solution, but eminently practical. There's no date on the Steam Music beta as of yet, but if you want to get in on the action you'll need to join the group and then wait for your number to be called. Beta participants will be selected at random, so you may need to exercise some patience. Maybe listen to some music while you wait?